Takeaway: Exercise balls can be a fun and inexpensive way to switch up your workout routine! They are convenient due to their portability. Most exercise balls can be deflated and inflated as needed. Exercise balls help improve stability and strengthen the core muscles through a variety of exercises. An exercise ball (often referred to as a Swiss ball) are soft elastic balls filled with air that usually has a diameter of approximately 35 to 85 centimeters. They are commonly used as an exercise tool for physical therapy, athletic training, and a variety of workout routines. Exercise balls are often used in physical therapy to treat people suffering from back pain. It can help relieve, treat, or prevent any future episodes of back pain. A research study conducted by The Journal of the Canadian Chiropractic Association tested the effects of using an exercise ball as a chair on two patients suffering from back pain. Both patients experienced a decrease in back pain as a result of consistently using the exercise ball. 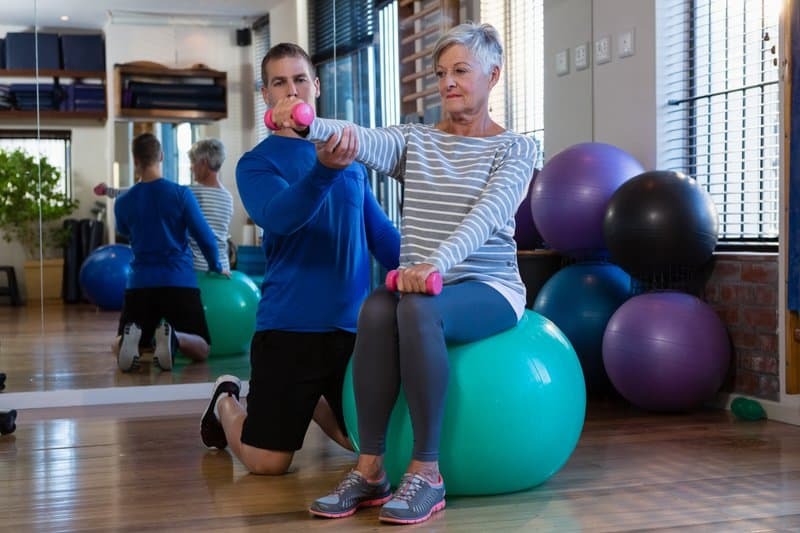 The exercise ball is thought to be effective in several rehabilitation programs due to its ability to strengthen and develop the core body muscles that help stabilize the spine. The body responds naturally to the instability of sitting on an exercise ball. Your back and abdominal muscles are used to help you maintain balance on the exercise ball which in turn builds strength in your upper body. Exercise balls are convenient due to their portability. Most exercise balls can be deflated and inflated as needed. When investing in an exercise ball, it is important to choose a ball that is durable and able to hold your body weight without losing its shape. What is a Half Exercise Ball? The formal name for a half exercise ball is a BOSU ball. BOSU stands for “both sides up” or “both sides utilized.” This type of ball is used in a variety of fitness programs because of its ability to enhance any workout. With a flat platform on one side and rubber dome-shape on the other, it helps to improve your balance, flexibility, reflexes, and body shape. Typically, the dome-shaped side is used for aerobic exercises and athletic training. When the ball is turned upside down, it is used as a tool for balance and stability training. The BOSU ball is a highly effective workout tool because it requires you to use more muscles for stability, making your workout that much more intense. Although a diameter of approximately 35 to 85 centimeters is standard for exercise balls, the size of exercise balls can vary. Physical therapists and exercise experts suggest using an exercise ball that fits your height and leg length, where your hips and knees are at a 90-degree angle, and your thighs are parallel to the ground. If possible, ask an exercise specialist which is the right size for you before purchasing an exercise ball. Large exercise balls are the most common. These balls are the most effective when it comes to core training and building strength in the stabilizing muscles of the body. Unlike body weight floor exercises, these large exercise balls challenge us to keep our balance and maintain good form. Small exercise balls also effective in making our workouts more challenging. However, small exercise balls don’t use your whole body instability or balance. Small exercise balls are a great way to strengthen your core during push-ups, Russian twists, and sit-ups. Holding a small exercise ball between your thighs while you perform different exercises can also highly engage your inner thighs and glutes. 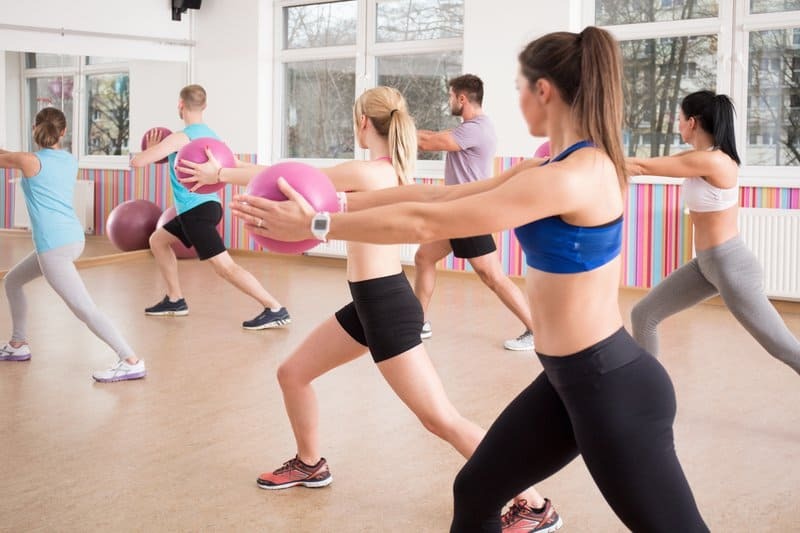 Small exercise balls are common in group fitness classes such as yoga, Pilates, and one-on-one personal training sessions. 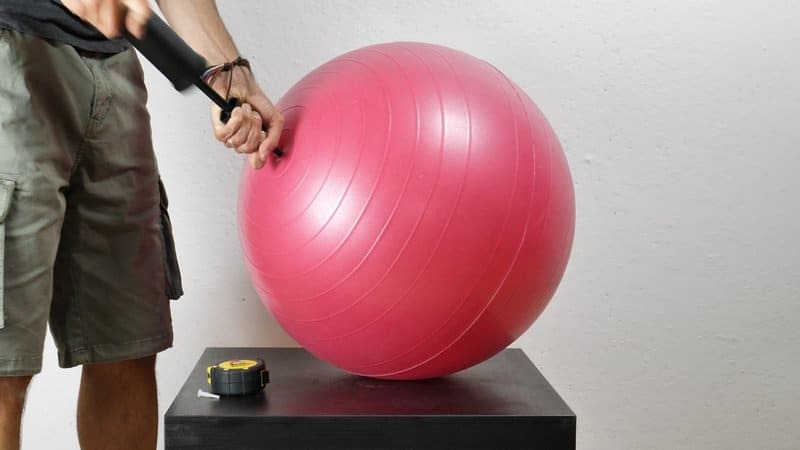 Exercise balls with a handle aren’t as common, but they do exist. These balls are designed to help your stability by giving you something to grip on to. Exercise balls that come with a handle might not be the best choice when it comes to exercise, but they are a great alternative for kids to play with outdoors or around the house. What are the Best Exercise Ball Workouts? If you don’t inflate your exercise ball properly, then you might find yourself with posture problems, back pain, and ineffective workouts. W ikiHow has a great article (with pictures) on how to properly inflate an exercise ball to get the most out of your new purchase! Keep in mind that adding excessive air to the exercise ball will increase the difficulty of balancing and stabilizing because the contact area decreases (aka the more air, the more circular the ball gets). The best exercise ball pump is the one that is most convenient and affordable for you. Amazon has a variety of brands with reviews to help you determine which air pump to invest in. The exercise ball you purchase might also be compatible with a specific air pump, so always double check the box for further instructions and recommendations. Inflating and deflating your exercise ball can be a tricky task. The good news is that most exercise balls come with an exercise ball plug remover. You can even purchase your own exercise ball plug remover from your local sporting goods stores if your ball did not come with one or if you’ve simply misplaced it. Start by sliding the prongs of the exercise ball plug remover around the plug, with one prong on each side. Squeeze the plug remover to grip the plug safely. Pull the plug remover up with enough force and remove the plug. This might take you a minute or two. Due to certain back conditions, an exercise ball is not suitable for everyone. If you experience severe back pain, it is best to seek professional advice before taking matters into your own hand. Likewise, if you have suffered an unstable spine injury, it might do more damage than good to use an exercise ball. Make sure you feel comfortable using an exercise ball before incorporating it into your daily exercise routine in order to prevent injury. This exercise builds strength in your hamstrings and glute muscles. Keep your core tight to engage your core, too! How to do it: Lie face-up with your back on the floor. Place your calves on top of the exercise ball, keeping your legs straight. Holding your core tight and squeezing your glutes, raise your hips off the floor. Your body should form a straight line from your shoulders to your heels—this is your starting position. Using your heels, roll the ball as close to your glutes as possible or until your knees form a 90-degree angle. Pause, then slowly straighten your legs as you roll your feet away from your glutes, returning to the starting position. This exercise is a bit advanced, so make sure you feel comfortable performing a basic push-up before giving this exercise a try. This declining push-up will challenge both your core and your arm muscles! How to do it: Start in a high plank position with your hands directly underneath your shoulders, and your toes on top of the exercise ball. Keep your core tight, squeeze your glutes, and keep your body in a straight line for the entirety of the move. Bend your elbows back to lower your chest towards the ground, keeping the elbows close to your body. Use the palms of your hands to push yourself back up to the starting plank position. Work on your stability by using your core and hips while also building strength in your glutes, hamstrings, and quads! The key to this exercise ball move is to do as many back-to-back reps as you can without rest. How to do it: Start by standing with your feet hip-width apart and the exercise ball between the middle of your back and a wall. Your feet should be slightly in front of your body. Bend your knees to roll your body down the ball to a squat position, keeping your thighs parallel to the floor. Your knees should be in line with your toes. Pause, then use your heels to press back up and return to the starting position. This hip thrust variation enables you to build your hamstrings and glutes by training one leg at a time. You can practice doing this exercise without the ball, and then when you feel comfortable, move over to the ball and begin! This move will also greatly help with any muscle imbalance you may have in your lower body. How to do it: Lie face-up with your back flat on the floor and both feet on the exercise ball; keep your legs bent at a 90-degree angle. Rest your arms by your sides on the ground. Lift one foot off the ball and extend it out straight. Keep your core tight, squeeze your glutes and thrust your hips up off the ground. Pause, then slowly lower your hips back to the ground. Remember to keep your body in a straight line for the entirety of the move. This exercise can temporarily relieve mild discomfort and build strength in your back. This is also a great way to strengthen your core and improve your posture. How to do it: Start with your stomach and hips on the ball, legs extended out behind you, and your feet a little wider than shoulder-width apart. Keep your core tight to engage your ab muscles and for additional stability. Raise your chest high (like a yoga cobra pose), bringing your hands to the back of your head. Hold for a beat or two, and bring your chest back down to return to the starting position. How to do it: Lie on the exercise ball with your lower back pressed against the surface of the ball. Your feet should be bent at the knee and pressed firmly against the floor. Your torso should be hanging off the top of the exercise ball. You can keep your hands behind your head or cross them in front of your chest to avoid straining your neck. Keep your hips on the ball, tighten your core, and curl your torso up to engage your abs (holding the position for a few seconds). Exhale when you curl up, and inhale when you lower back down. Your lower back should always remain in contact with the ball. How to do it: Lie face-up with your upper back on the exercise ball and your feet flat on the floor. Your knees should be bent at a 90-degree angle, and your hips should be extended so that your torso is in a straight line. Keeping your core tight, extend your arms straight above your chest with your palms pressed together. Rotate your torso to roll onto one shoulder as far as you can without losing your balance. Rotate back to the middle, and then rotate to the opposite side. How to do it: Start by kneeling down on the floor and placing your hands on the exercise ball. Keep your knees hip-width apart and your toes on the floor for stability. Keeping your back flat and core braced, and without moving your knees, slowly roll forward so the ball comes to your forearms, until your body forms a diagonal line from your head to your knees. Pause, then roll back to the starting position. How to do it: Lie face-up with your back flat on the floor and your legs extended out in front of you. Hold the exercise ball overhead with both hands. Keep your core tight to avoid any arching in your back—this is your starting position. Use your core to lift your arms and legs, while simultaneously placing the ball between your calves, creating a “V” position with your body. Lower back down with the exercise ball between your legs. Now repeat the movement, but this time you’ll be placing the ball back in your hands. How to do it: Get in a high plank position with your hands directly underneath your shoulders and your shins on top of a stability ball. Keep your core tight to ensure your body stays in a straight line—this is your starting position. Keeping your core tight, bend your knees to roll the exercise ball toward your hands until your toes are resting on the surface of the ball. The key to this move is to keep your hips down the entire time. Pause, then slowly straighten your legs back behind you, returning to the starting position.